Lucraft and Luckraft One-name Study: ADMIRAL THE RT. HON. SIR ASTLEY COOPER KEY, G.C.B., F.R.S. ADMIRAL THE RT. HON. 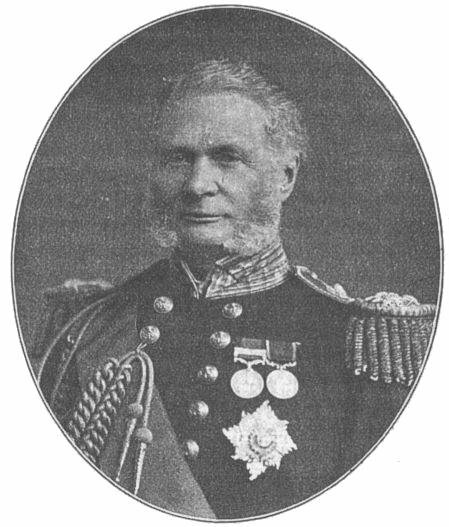 SIR ASTLEY COOPER KEY, G.C.B., F.R.S. This text is taken from a website about the Navy, and covers part of the Crimea campaign. Charles Maxwell Lucraft gets a couple of mentions. The full details are at http://www.pdavis.nl/Russia4.htm from where I have shamelessly lifted this small section. The explosions alluded to, and especially the second, which was, in effect, a series of explosions lasting more than two minutes, were very severe, and are believed to have cost the enemy a large number of lives. As sunset drew near, Dundas recalled the gunboats, in consequence of the intricate nature of the navigation, and of the fact that more than one of them had grounded even in daylight. But the French battery on Abraham Holrn went on with the bombardment; and, at half-past ten, the boats of the fleet, assembled under Captain Henry Caldwell, began a three-hours' fire with rockets upon the fortress, causing new conflagrations and increasing the old ones. These rocket-boats, about thirty in number, were commanded by Lieutenants Leveson Eliot Henry Somerset, and Thomas Barnardiston (Duke of Wellington), Charles Maxwell Luckraft (Euryalus), Henry Bedford Woolcombe, and Cornwallis Wykeham Martin (Arrogant), John Binney Scott, and Francis Moubray Prattent (Pembroke), Robert Boyle Miller (Vulture), John Appleby Pritchard (Edinburgh), John Bousquet Field (Cossack), Thomas Stackhouse (Dragon), Henry Bartlett King (Magicienne), William Naper Cornwall, and Francis Bland Herbert (Geyser), Robert Cooper Atonal, and Maxwell Fox (Cornwallis), John Dobree M'Crea, and James Graham Goodenough (Hastings), and Armine Wodehouse, and Charles Henry Clutterbuck (Amphion), together with junior officers. The premature explosion of a rocket in the pinnace of the Hastings wounded two men; nine persons were also wounded by a somewhat similar accident in the pinnace of the Vulture, and there were other slight casualties, very few, however, of which were due to the enemy's fire. The boats of the Cornwallis, Hastings, and Amphion were employed, not against the forts, but against a frigate which lay moored in Kungs Sund. The vessel could not be burnt; but Lieutenant Tattnall, senior officer of these boats, was praised by Captain Wellesley for the manner in which he had carried out-orders. "At daylight on the morning of the 10th," continues Dundas, "the positions of the several mortar-vessels had been advanced within easier range, and the gunboats were again directed to engage. The three-decked ship, which had been moored by the enemy to block and defend the channel between Gustafvaard and Bakholmen, had been withdrawn during the night to a more secure position; but the fire from the batteries was increased, and the engagement was renewed with activity on both sides. Fires continued to burn without intermission within the fortress, and about noon a column of smoke, heavier and darker than any which had yet been observed, and succeeded by blight flames, gave signs that the shells had reached combustible materials in the direction of the arsenal." The conflagration had, in fact, spread beyond the island of Vargon, and had extended to East Svarto, in its rear. During the whole night of the 10th, a heavy fire was kept up; and, upon the recall of the gunboats as before, divisions of mortar-boats again proceeded to annoy the enemy. One division, directed by Captain George Henry Seymour, of the Pembroke, was under the orders of Lieutenants Robert James Wynniatt, and James Carter Campbell (Exmouth), Charles Maxwell Luckraft (Euryalus), Henry Bedford Woolcombe, and Cornwallis Wykeham Martin (Arrogant), John Binney Scott, and Francis Moubray Prattent (Pembroke), and Henry Bartlett King (Magicienne}. The other division, directed by Captain Caldwell, was under the orders of Lieutenants Leveson Eliot Henry Somerset, and Thomas Barnardiston (Duke of Wellington), John Appleby Pritchard, and William Hans Blake (Edinburgh), Robert Boyle Miller (Vulture), and John Bousquet Field (Cossack), assisted by junior officers. In the course of the night, seeing that nearly every building on Vargon had been destroyed, and that such buildings as remained standing on East Svarto were almost, if not quite, out of range, while the enemy scarcely returned the fire, the allied Admirals agreed to discontinue the action before daylight on the 11th. By that time, most of the mortars had been disabled, and two, if not three, completely split ("It is a disgrace to our iron-founders that one old mortar of the last war stood 350 rounds, while all the others, quite new, were unfit for use, or burst, after 200 to 250", Sulivan); and the vents of some of the French guns employed in the attack had fused. There were, unfortunately, no spare mortars, owing to lack of prevision at home. There had, however, been singularly few casualties on the side of the attack, only one man, it is said, having actually lost his life. The British alone had expanded in the bombardment about 100 tons of powder, and 1000 tons of projectiles (the French mortars threw 2828 shells, and the French vessels, apart from the mortar-vessels, 1322 shells and round shot).